Donnie Jones Photography is a Tampa, Florida photography studio that specializes in weddings, engagements, high school senior portraits and maternity photography. Donnie is a very talented photographer and someone who understands the importance of building a brand and doing everything right the first time around. He is pretty much our ideal client and we can’t wait to see his success. 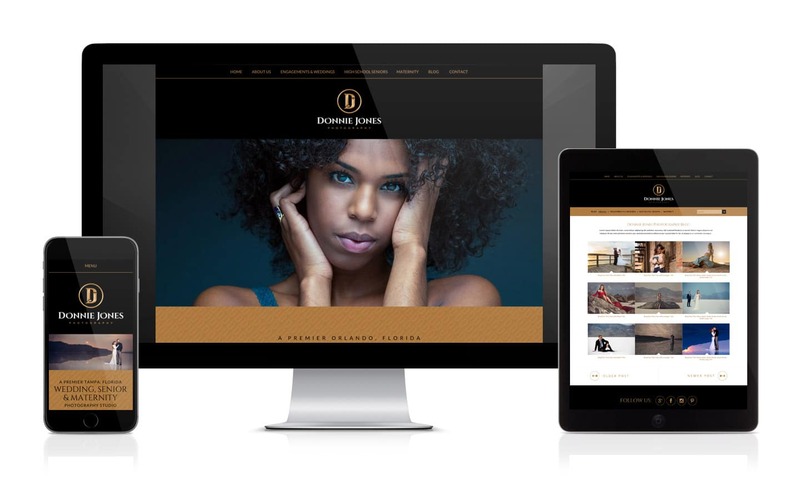 Donnie Jones Photography came to Visual Lure wanting a luxury, high-end looking branding package, and we’re confident that we delivered. It started with the logo which features an integrated DJ monogram along with a logo for his premier Gold Collection. We then designed an identity package which included business cards, letterhead and envelopes. We finished everything off with a fully-custom, responsive, fast-loading, easy to maintain WordPress website. The website features a large random loading image on the home page, a fully integrated blog, a sticky header, masonry light box photo galleries and subtle CSS animation effect that give the site a sense of elegance and sophistication.